ASDIP CONCRETE is structural engineering software for design of concrete members. ASDIP CONCRETE software includes the design of multi-span continuous beams based on the latest ACI 318 provisions. Following is an overview of the steps required to design continuous beams using ASDIP CONCRETE. Select the beam type, either Rectangular, T-beam, Spandrel, Inverted-T, or L-beam. Enter the span dimensions and properties in the Geometry tab. Specify the number and type of supports. ASDIP CONCRETE offers an At-a-Glance presentation of results, organized by topic. Enter the material properties in the Materials tab. Specify the concrete stress-strain, either Hognestad or Whitney. Specify the steel stress-strain, either Elasto-plastic or Strain-hardening. 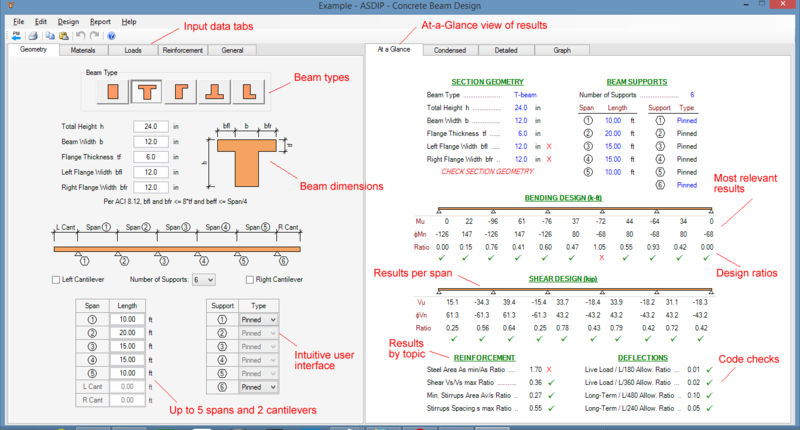 ASDIP CONCRETE offers a Condensed presentation of results, organized by topic and load combination. Use the Loads tab to enter uniform and concentrated loads per span. Specify whether the loads will be combined internally or are pre-combined. Copy loads to other segments to simplify the data input. 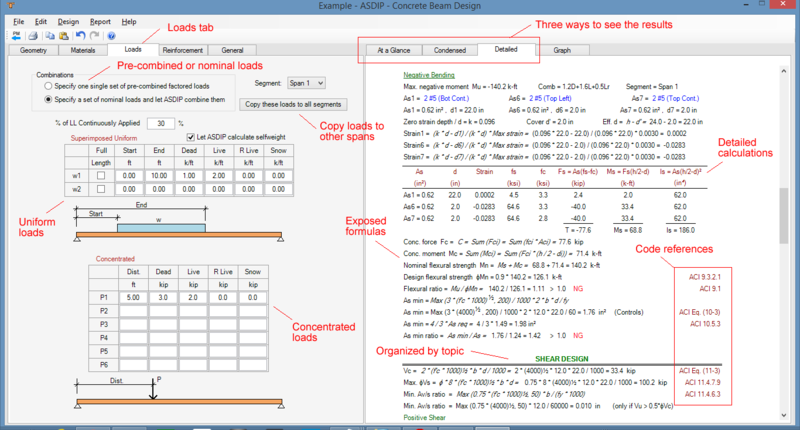 ASDIP CONCRETE includes a Detailed tab showing step-by-step calculations organized by topic, with exposed formulas and references to the design Code. Specify top and bottom rebars, and stirrups in the Reinforcement tab. Copy rebars to other segments to simplify the data input. 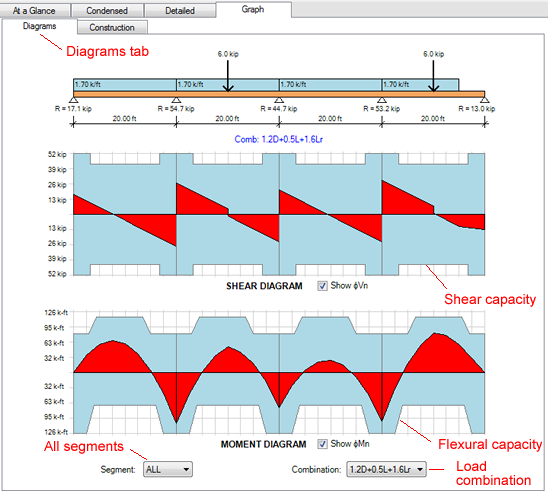 This structural engineering software offers graphic presentation of loads, diagrams, and reactions. 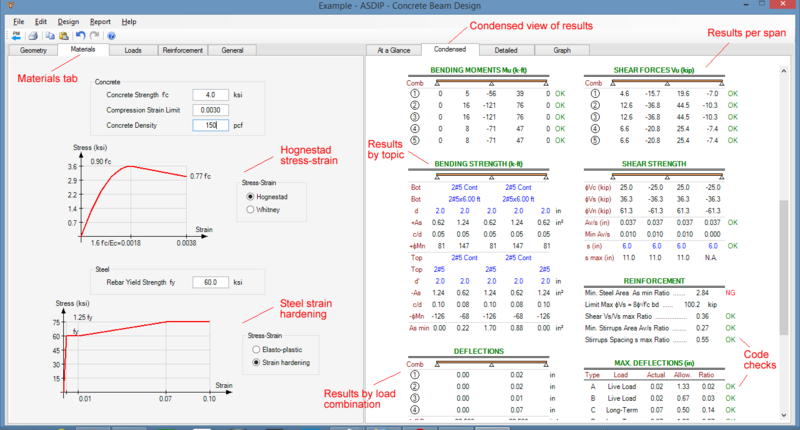 ASDIP CONCRETE engineering software shows graphically the reinforcement along the continuous beam. Check thoroughly the length and position of the rebars. 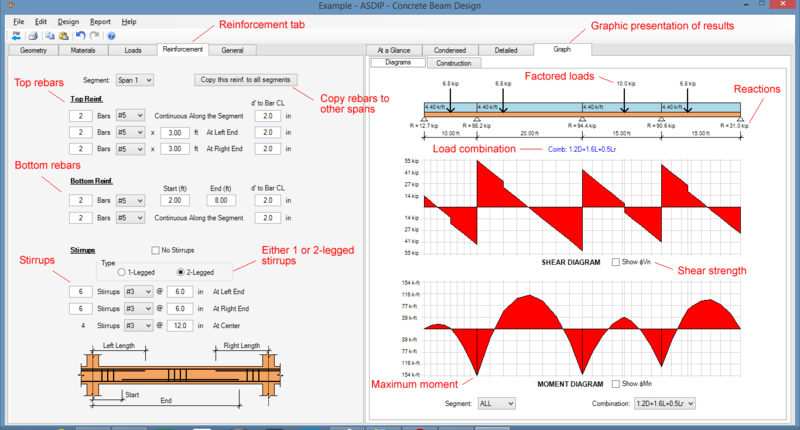 ASDIP CONCRETE software shows graphically the shear and bending strength diagrams along the continuous beam. Verify that the shear and bending stresses are under the capacity envelope shown as a blue shaded area everywhere along the beam. Thoroughly review the results to make sure that all the checks pass. Change dimensions and rebars if necessary. Optimize your design by making an efficient use of the beam structural capacity. Detailed information is available about this structural engineering software by visiting ASDIP CONCRETE. For engineering background, see our blog post Concrete Continuous Beams: A Structural Design Challenge. You are invited to download a Free 15-Day Software Trial or go ahead and Place Your Order.